The roots of First Congregational Church go back almost to the beginning of St. Anthony, and the building’s steeple has served as a Marcy-Holmes landmark since the late 1880s. Organized in 1851 as the First Congregational Church of St. Anthony by Reverends Richard Hall and Charles Seccombe, the original congregation consisted of seven women and five men. For the first few years the congregation met near the present-day Chute Square at the intersection of Central and University Avenues in a schoolhouse that served as the University of Minnesota. The congregation’s first “real” church was a wood-frame structure built at Fourth Street NE near East Hennepin. 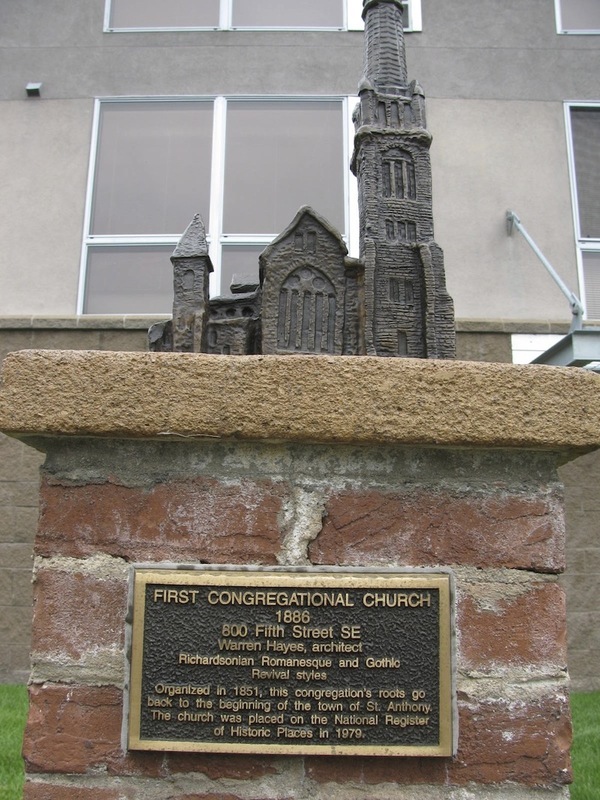 By 1873, the congregation had outgrown that building and had built a larger wood-frame church at 5th Street SE near Third Avenue SE, now the site of Marcy Open School and Holmes Park. Built for $20,000 and dedicated in 1874, the building met an untimely demise when it was destroyed by fire in 1886. The congregation immediately planned a new church—this time made of stone—further up the street on 8th Avenue SE. By September of that year, construction had begun, and services were temporarily being held in a skating rink at 5th Street SE and 12th Avenue SE. Noted church architect Warren Hayes was selected to design the new church. 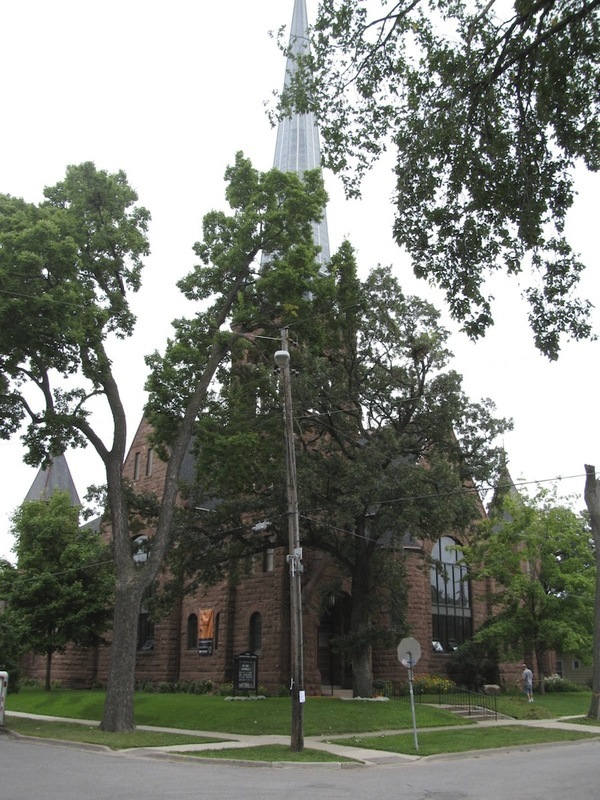 Hayes had designed many other Minneapolis buildings, including Wesley United Methodist Church on 1st Avenue and Grant Street, the University of Minnesota’s Music Education building and Frey House at 1206 5th Street SE. Hayes’ design for First Congregation featured the “Akron Plan,” which called for a sliding wall that allowed the Sunday school to meet separately or join the main church service. Hayes’ design also included elements of the then popular “Richardsonian Romanesque,” evident in the rough-cut Lake Superior brownstone exterior and the rounded arch windows. It also included Gothic Revival elements such as the towering spire supported by delicate columns. Dedicated on March 4, 1888, the church drew a great deal of attention from the local press. The Minneapolis Tribune noted that the floor around the pulpit was graded to give all seats encircling it the same clear view. The windows are particularly noteworthy. They feature geometric shapes of olive, brown and light blue and were designed by the art director of the Tiffany Glass Company. The church, which cost $76,000 to build, was placed on the National Register of Historic Places in 1979. It is also part of the locally designated Fifth Street Historic District. 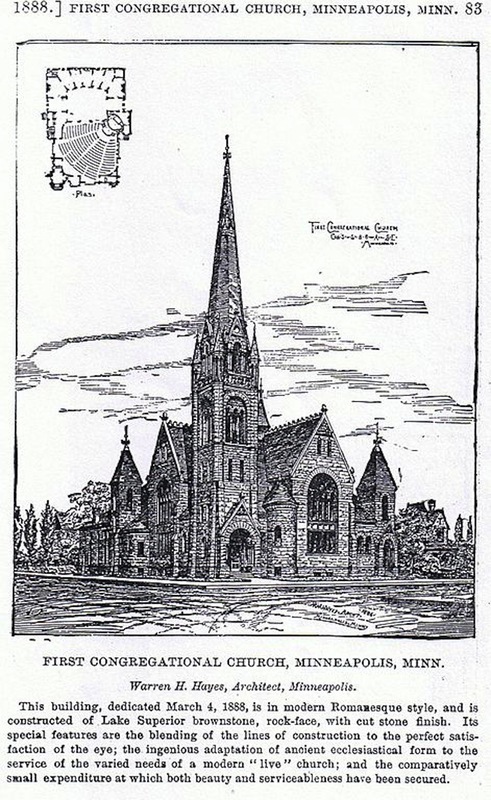 Marcy-Holmes Neighborhood Association, “First Congregational Church (1886) ,” Minneapolis Historical, accessed April 22, 2019, http://minneapolishistorical.org/items/show/94.